This is Maria. Working close to the land has been her life since she was a young woman. Her choice to become a shepherdess goes counter to deep-seated traditional roles in Greece, where land and animals are thought to be the province of men. She reminds us, earth is a she. The audio for Earth is she is an original composition, created in collaboration with musician/composer/vocalist Prassanna Vishwanathan. 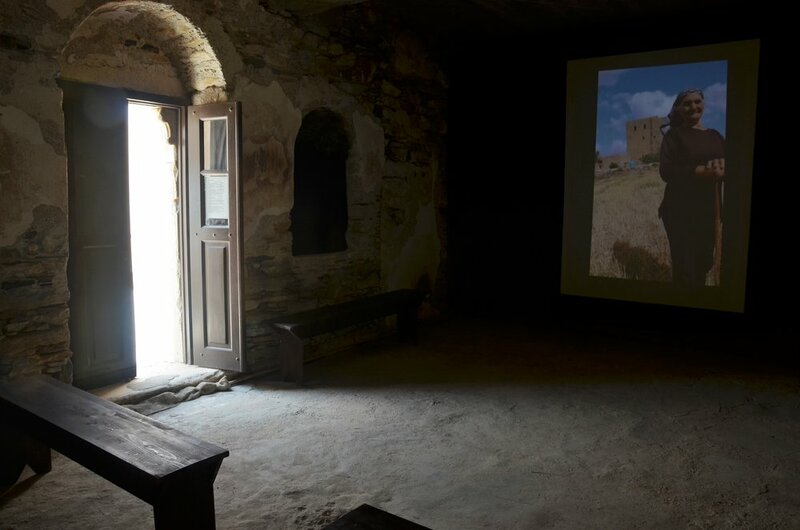 The piece features field recordings made in Naxos while accompanying shepherdess Maria Makari in her daily work, and vocals rendered by Prassanna. We collaborated across New York, India, and Greece until we landed on this version, which feels born of the land and is in honor of Maria. This work was created in residence at the Bazeos Tower in Naxos, Greece. Five artists, including myself, were invited to live in the space, respond to its inspirations, and fill it with site-responsive work. We had 21 days from arrival to opening night. The theme–Around & About–-is about establishing a creative dialogue with our natural surroundings, the history, and the characteristics of the environment. In my work, I explore the living portrait, invite people listen, and bring into awareness the things that the eye/mind might miss or not perceive completely. Earth is she is a multimedia installation composed of living portraits, sound design, and environmental theater. In the installation, the living portraits are projected 8 feet high. Enormous thanks and gratitude to Maria Makari, who I am in awe of; Prassanna Vishwanathan for his masterful vocals, and; the Bazeos Tower team, for their vision and artistic support: Curator, Mario Vazaios; Vice curator: Klaus Pfeiffer; Technical curator: Katerina Zourari. Additional acknowledgments: Audio post-production: Phil Moffa @buthchasound; Video editing: Katerina Zourari; Photos: Installation view (top center): Georgia Papad; Tower at night: ©DieterDU.